Attractive Cottage A Pool With A View of the Rio and Portugal.Walks from Gate. 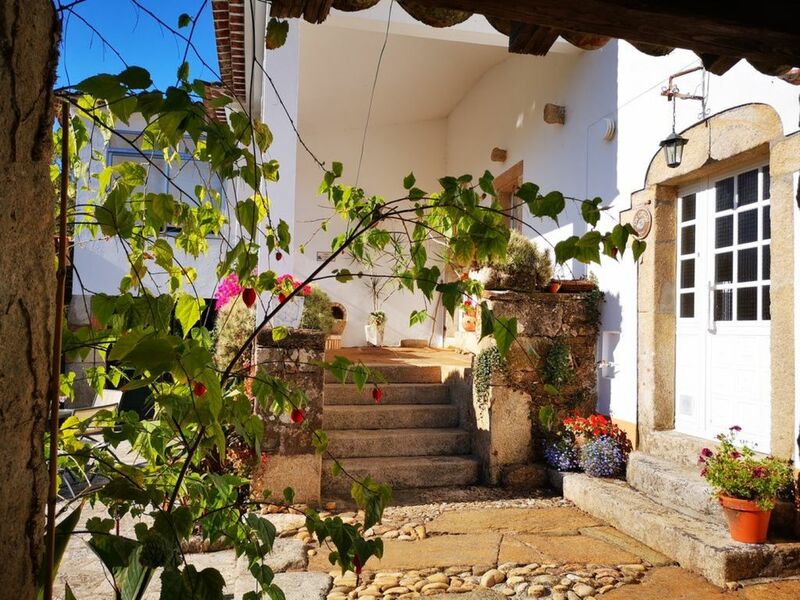 The Cottage and Casitas are housed in the grounds of a beautiful Rustic Finca, in a elevated position, with gorgeous views to Portugal and River Minho. Good sized swimming pool 'with a view' in mature green and secure grounds. All have either terrace or shaded areas for sitting out, and have use of BBQ, and recreational areas. Peaceful area, with river, forest and hill walks direct from Finca. Sandy river beach, safe for swimming, 10 minutes walk, with many gorgeous sandy sea beaches within 15- 30 minutes drive, on both Spanish and Portuguese side. Good restaurants within walking distance, and in the heart of The Albarino wine producing area of Rosal. Lots to do and see with Celtic and Roman and other historical remains abundant in the locality. Water sports, riding, walking trips and cycling can be organised locally. Ideal location for couples, families or larger groups with a separate large reception room available if required. Check Finca Rio Mino comments on search sites. Central Heating and wood burning fire. All be, bathroom and kitchen linens provided. Reasonably fast internet throughout the property and outside in areas close to the Cottage and Bodega room..
most requirements are available. If no..please ask. a comprehensive /complete assortment of glass and china utensils are available . A complete set of cooking containers and accessories. Communal TV in Bodega Room. Large Bodega room for family gatherings, and peace and quiet. Board games and small library. Many board and out door family games. Extensive, secure garden with fruit trees and plants. For Hire. To reserve and delivered to The Finca. Two terraces one in sun and other with shade. Both with tables and chairs for outside dining. Three course withing one hours drive. Secure pool with wall and lockable gate. 12 x 4.5 Metre pool with large lounging area with sunbeds, tables and chairs, Shower unit in the pool area.. Large shaded terrace. Worked really well for our family - completely peaceful lovely place to relax but easy access to great swimming spots and other activities. Loved being able to walk to good local restaurants in the evenings. My only hesitation in recommending the finca is that we plan to return and don’t want it all booked up! Thank you.We would be pleased to see you all return. This was our 2nd time at the property. This time we went horse riding, swimming in mountain rivers and white water rafting - all arranged via Robin. Again as before he was brilliant in giving us tips and making calls on our behalf. Robin and his animals (Brock, Dylan and the cats) make this place special. The setting is Beautiful, the weather was sunny but not too hot compared to the rest of Spain. Our teenage daughters loved the pool and crossing back and forth between Spain and Portugal to go body boarding. We would definitely recommend this place. Robin runs a lovely small group of properties at Finca Rio Mino. The facilities and surroundings are great and Robin's help and local knowledge will make your stay very enjoyable. We stayed in the Cottage which we loved for our group of 3 adults and a baby. It is much bigger than the photos,has great outdoor space to eat and absorb the atmosphere of the region, and amazing views from the upstairs bedroom. We loved the full working kitchen and ate half our meals in. We would definitely return to Finca Rio Minho again and we never repeat holidays. There are so many places to explore nearby - we barely touched the surface during our 8 days there. Highly recommend renting bikes to ride along the trails just outside the cottage that go along the river and you can take a bridge to a cute town in Portugal. To finish it off, Robin and Deb were amazing hosts who did not hesitate to help with anything we needed - Robin even introduced us to some of his friends at the village fiesta. Just book it! Beautiful cottages in a stunning location. My husband and I booked for a week and wished we’d booked for more. As it was Galicia and late in the season we expected changeable weather and were prepared with jumpers and macs, but when the mist cleared in the early mornings we had a warm sunny seven days. A wonderful place to kick back and soak up the sun, swim in the pool and enjoy beautiful views of Portugal from the terrace or explore fabulous sea and river beaches just a short walk or drive away. We stayed in one of the Casitas, which were cosy and well equipped. We like to eat in as well as sample local cuisine and the kitchen had everything a master chef needs and Robin was on hand to provide any extras needed. I’m not a dog or cat lover, but, much to my children’s amazement, I fell in love with Robin’s dogs Broc, and Dylan and cats Minnie and Pixie who all made us feel welcome and at home. Fabulous place. Looking forward to returning. Thank you Denise for your thoughtful and comprehensive review, The reference to the good weather in late September is particularly helpful, as many potential guests are not aware of the favourable 'micro climate' in the Baixo Mino area of Southern Galicia. Everything about our stay in the cottage was what a holiday should be - stress-free! The booking process was easy and travel straightforward. We received a warm welcome from Robin and the dogs with an introduction to the area accompanied by a cool glass of local wine. The cottage was perfect - clean and well-equipped. Robin ensured we had all we needed and his local knowledge was invaluable as we set out to explore the area. He arranged bike hire for a week of our stay. The bikes just turned up without us having to do anything. We enjoyed a variety of cycle rides including flat riverside cycle paths and the more challenging climb up Monte Tegra. They were also useful in cycling to the coast. We took advantage of Robin's restaurant recommendations, all the more enjoyable because we could walk to several local ones. Our days took on a lovely pattern - a cycle, walk,coast or town visit, and then back to swim in the pool or wander down to swim from the river beach. In the evening the only decision was do we eat out or do we have a bbq and if so which table should be eat at - the one in the sun or the one in the shade of the vine. This is what constitutes a relaxing and care-free holiday! I would also add that the internet access was good, important for us as we were travelling with teenagers (17 and 14). All credit to Robin in ensuring that this was the perfect base in which to explore unspoilt Galicia.